The steamed marmalade sponge pudding recipe is an excellent representative of what is great about great British puddings; it is moist, warm, sticky, nurturing and heaped with nostalgia and childhood memories. Using marmalade in the pudding brings an incredible depth of flavor, use homemade, or even a jar of shop bought works well. The marmalade brings more than flavor, we may add, it adds a lovely stickiness to the pudding as well. The pudding is easy to make. However, it needs planning as the pudding as it requires steaming for a minimum of 1½ hours. Once the pudding on to steam, little else is needed except to check frequently that the water has not boiled dry. This steamed sponge pudding recipe comes courtesy of Gordon Ramsay, from his book, World Kitchen. The book is a journey through world cuisines, highlighting Gordon's favorite recipes from each region. Lightly butter a 1.2-liter pudding basin. 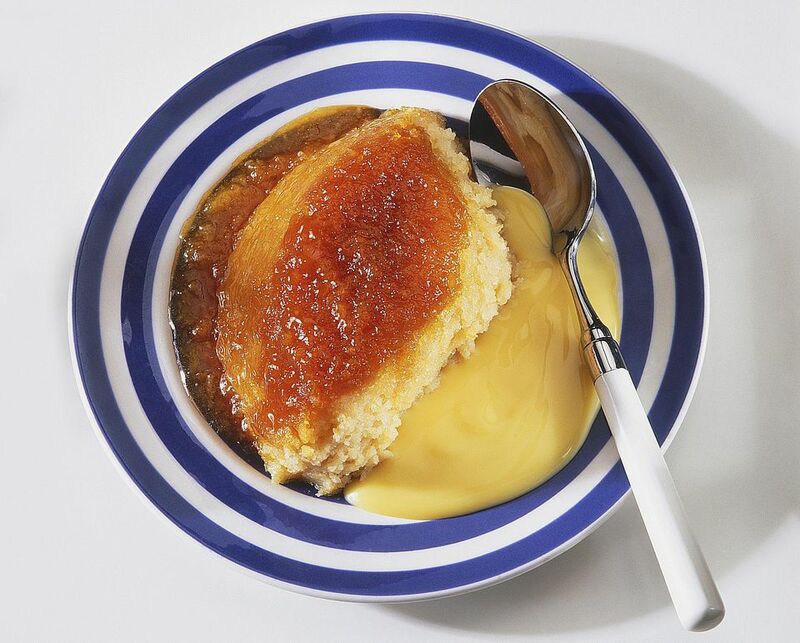 Mix 1 tablespoon of the marmalade with the golden syrup and orange zest and spread over the bottom of the pudding basin. Cream together the butter and sugar, using an electric mixer, until soft. With the motor still running, add the beaten eggs a little at a time, making sure each addition is fully incorporated before the next is added. Sift in the flour and baking powder and fold alternately with the milk and remaining marmalade to obtain a smooth mixture. Spoon gently into the pudding basin—try not to be over vigorous here or you may lose air which was incorporated in the beating which will make the pudding dense. Lay a pleated buttered sheet of greaseproof on top of the basin, buttered side down, and cover with a pleated sheet of foil, of the same size. Secure tightly with string under the rim of the basin. Stand the basin on a trivet or upturned small heatproof plate in a large saucepan. Pour in enough boiling water to come halfway up the side of the basin and bring to a steady simmer. Cover with a tight-fitting lid and steam for 1½ hours, checking the water level every 30 minutes or so, and topping up with boiling water as needed. To check the pudding is ready, unwrap and insert a skewer into the sponge; it should come out clean. Unmould the hot pudding onto a warm serving plate and serve with cream or custard.